(I Chron. xix. 6): A district south of Damascus, bordering on the trans-Jordanic territory of Manasseh. Maachah is said in Gen. xxii. 24 to have been a descendant of Nahor, Abraham's brother, and the territory called after him is declared in Josh. xiii. 13 not to have been conquered in the first Israelitish settlement of Canaan. David made its petty king tributary (II Sam. x. 6-8), and by the time of the chronicler, Maachah was regarded as an ancestress of a Manassite clan (I Chron. vii. 16). Strangely enough, II Sam. x. 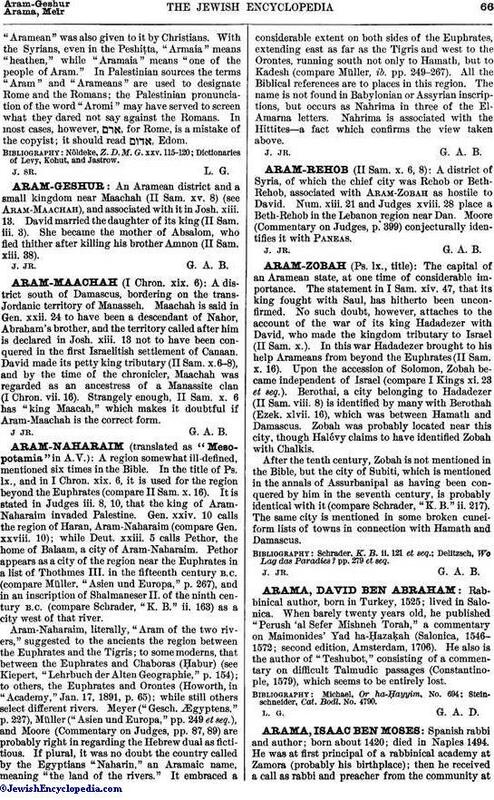 6 has "king Maacah," which makes it doubtful if Aram-Maachah is the correct form.